Names and some details have been changed in this real case. Sean O’Reilly’s eyes widened in shock as he saw the truck heading directly towards his car. The impact caused him to experience pain in his head, neck, and lower back. He struck both knees against the dashboard. He was released to the care of his local physician after evaluation in the emergency department. Sean continued to have pain, crepitus, and swelling in his right leg for over 2 years after the accident. He had trouble squatting to pick up his child, kneeling to tie his shoes, and standing for long periods. Sean was a slight, healthy 23-year-old man at the time of the accident. Sean’s doctor advised that an arthroscopic procedure was needed to evaluate the inside of his knee. Traumatic patellofemoral chondromalacia and lateral patellofemoral mailtracking were found during this procedure. The physician removed loose fragments of cartilage and repaired some of the internal damage. Sean continued to have some pain following this procedure. The plaintiff’s physician attributed the damage to the trauma; the defense’s physician stated that these problems were pre-existing. Who has the more credible position? The answer to this question lies in understanding the knee. The knee joint is created when three bones meet: the femur, tibia, and fibula. The ends of the bones are covered with a tough elastic cartilage that cushions the joint. Two C-shaped pads of cartilage called menisci also provide cushioning. Ligaments help to stabilize the knee. The four main stabilizing ligaments are the anterior cruciate ligament (the ACL), posterior cruciate ligament (PCL), lateral collateral ligament (LCL) and the medial collateral ligament (MCL). √ Warm up before playing sports or exercising. Stretch the front and back of your thighs. √ Strengthen your leg muscles by lifting weights, walking up stairs, or riding a bike. √ Avoid sudden changes in the intensity of exercise. √ Wear well-fitting shoes that are in good condition. √ Maintain a healthy weight. Extra pounds put pressure on the knees. The knee joint is the largest human joint in terms of its volume and surface area of articulating (joining) cartilage. The knee joint is also the most complex one in the body and has the greatest susceptibility to injury, age-related wear and tear, inflammatory arthritis, and septic arthritis. Patients with knee problems may have complaints that fit into one or more of three broad categories: symptoms related to a specific anatomical diagnosis including localized pain, swelling, and abnormal noise (clicking, popping, grinding); symptoms that suggest a joint effusion (collection of fluid) such as swelling and impaired bending, and symptoms that reflect the change in knee function, such as weakness, giving out, catching, and difficulty walking (limping, contusion and complaints of pain, catching, swelling, and fatigue and favoring one knee). 1 Orthopedic surgeons use many tests to examine the knee, including the FABER test. Trauma can result from an acute injury, such as a contusion, fracture, dislocation, or tendon rupture. A direct blow to the knee can cause this kind of acute injury. But trauma can also occur from overuse, leading to tendinitis and bursitis – known as jumper’s knee, runner’s knee, and housemaid’s knee, depending on the part of the knee involved. Posttraumatic chondromalacia patellae is one of the late effects of trauma. It can develop if there is a blow to the kneecap that tears off a piece of cartilage or bone. However, it can also be idiopathic (no known cause), a point that favors the defense’s position. In addition to the chondromalacia patella revealed during the arthroscopic exam, Sean’s knee also had patellofemoral mailtracking. The normal patella should track in the groove of the femur in a relatively straight manner. Unfortunately, the patella may track more to one side or even come partially out of the groove, which is called subluxation. Maltracking can be caused by a genetic, developmental, or familiar abnormality, a point that helps the defense expert’s position. A child may be born with a varus or valgus of the knee, muscle tightness, or a wide pelvis. Maltracking may also be caused by overuse from repetitive knee flexion, uphill running, hiking, kneeling, squatting, or prolonged sitting with knees flexed. This condition can also be precipitated by a blow to the knee or impact of the knees with a dashboard. The physician who examined Sean for the defense noted that he was employed in a sales job at the time of the accident. Sean had no prior history of trauma to his knees. This physician opined that the maltracking of the knee caused the chondromalacia; was a preexisting condition, and not related to the trauma of the motor vehicle accident. Sean’s treating orthopaedist documented that he had no prior history of knee injuries or complaints. The motor vehicle accident resulted in a weakness of his knee. An MRI showed effusion, and the arthroscopic exam found patellofemoral injury, loose fragments, and maltracking. Med League was asked to provide literature about the conditions detailed in the patient’s medical records in anticipation of the deposition of the defense doctor. The key to understanding the patient’s injury is to keep the focus on the absence of prior complaints, the symptoms being consistent with acute trauma, and the finding of loose fragments of cartilage. There is no indication that Sean was injured through overuse – he was not a runner or athlete; his musculoskeletal function was normal. Sean was not in the correct age group to be suffering from arthritis. The weight of the evidence favored the traumatic origin of his symptoms. The attorney went to the deposition armed with the knowledge needed to depose the physician. Anderson, R. and Anderson, B. 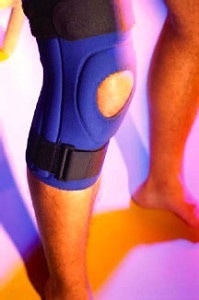 “Evaluation of the adult patient with knee pain”, UpToDate, www.utdol.com. Merchant, A.”Patellofemerol joint disorders” in Chapman, M. (Editor), Chapman’s Orthopaedic Surgery, 3rd Edition, Lippincott Williams and Wilkins, 2001. “What are Knee Problems?” NIH, www.niams.nih.gov.